Defending Champion Tommy Hill from Swan Yamaha team rding on Yamaha R1 finished in first position at Oulton park free practice session 1.His fastest lap was 1:36.385. Following in second place was Josh Brookes from Tyco Suzukit eam riding on Suzuki GSX-R1000 with fastest lap time of 1:36.938 with a time difference of 0.533 seconds. In third place was Shane Byrne from Rapid Solicitors Kawasaki riding on Kawasaki Ninjaa ZX-10R with fastest lap time of 1:37.107 falling behind by 0.722 seconds. 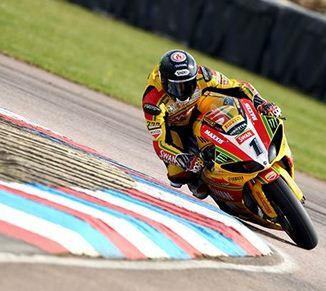 Finished in fourth place was Alex Lowes from Team WFR riding on Honda CBR1000RR with time difference of 1.205 seconds. Chris Walker from primo Bournemouth Kawasaki Racing with time difference of 1.389 seconds. The Privateer Ducati teams had yet to see success the three Satellite Ducati Panigale 1199 RS bike riders Scott Smart,Alex Polita and Tom Tunstall finished in 24 th,25 th and 29 th position respectively. The fastest Satellite BMW S1000RR on the track with Barry Burrel as its rider finished in 12 th place.